We are now starting the process of pinning the 12,000 poppies made by the local schoolchildren on to the netting that will then cascade down the tower of St Christopher’s Church. See the attached illustration of how it will look. 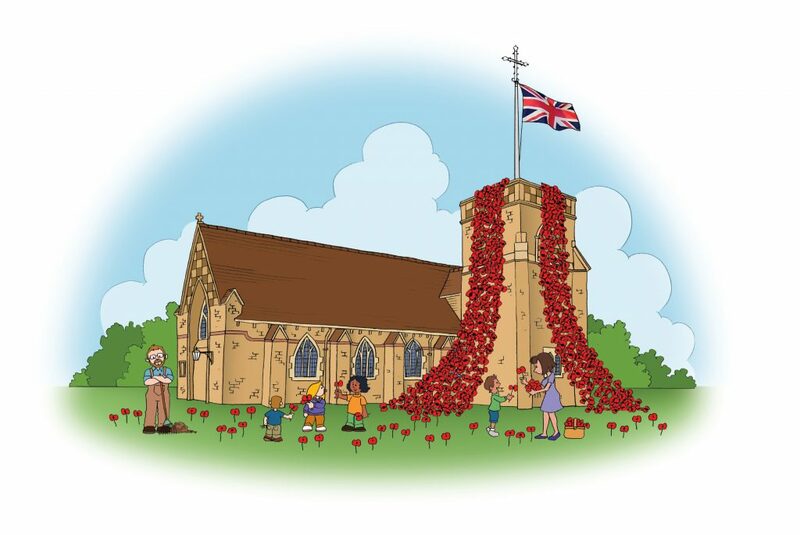 The work to pin the poppies on to the netting will be done from inside St Christopher’s Church and will take place from either a standing or sitting position off the church floor. The poppies will be pinned on with a combination of twisted wire or cable ties through the central button of the poppy and the ideal number of people required to form a production team would be 8 – 10 people. There will always be a member of the Commemoration Committee in attendance and to be fully inclusive, we will open the Church on specific times during the day, evenings and at weekends to enable this part of the project to be completed. The current times that the Church will be open for this work to take place is 2:30 – 5:00pm Monday to Friday and then 10:00 – 12:00 noon on Saturdays. Therefore if you are able to join us on any of these days / times, we would be glad to see you. This entry was posted in Haslemere first and tagged Haslemere, HaslemereToday, HaslemereTomorrow, HaslemereYesterday, St Christopher's, War Memorial on February 28, 2018 by admin.